See ‘We’re Going on a Bear Hunt’ live on stage at the Lyric Theatre in London! We’re Going on a Bear Hunt is coming back to the West End after more than ten years. This time it’s returning to the Lyric Theatre, Shaftesbury Avenue from 4 July. Music, laughter, rhymes, rhythms and repetitions together with puppetry, paint, water and mud… not to mention a bear – we’re not scared! – make this fun-filled adventure the perfect theatrical outing for all young families. 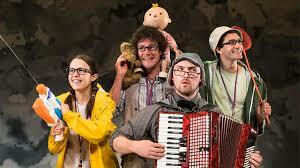 Sally Cookson’s hugely inventive production set to Benji Bower’s lively musical score is a mischievous celebration of play, utilising everyday objects and materials to capture the imagination and propel audiences into the world of Michael Rosen and Helen Oxenbury’s much loved picture book. Join our intrepid family of adventurers and their musical dog as they wade through the swishy swashy grass, the splishy splashy river and the oozy squelchy mud, in search of a bear. Expect plenty of interaction and a few surprises along the way. We’re Going on a Bear Hunt is an action-packed treat for those who love the book and the ideal theatrical experience for first time theatregoers. We’re Going on a Bear Hunt is presented by Kenny Wax Family Entertainment and is created by the critically acclaimed production team including director Sally Cookson, composer Benji Bower, designer Katie Sykes, lighting designer Tony Simpson, sound designer Jason Barnes, associate director and puppet designer Marc Parrett. The cast will be announced later this year. « Book now to see Mamma Mia! live on stage at London’s Novello Theatre!